Paul Greenberg’s expose on the global commercial fishing industry is less a lament for a traditional way-of-life lost to industrialization than it is a dire warning of about the biological impacts of our current methods of fish cultivation. Greenberg is concerned not just with the auxiliary impacts of commercial fishing on “undesirable” marine species discarded as bycatch, but the secondary impacts of our selective breeding of four particular fish humanity has deemed pleasant to the palate. 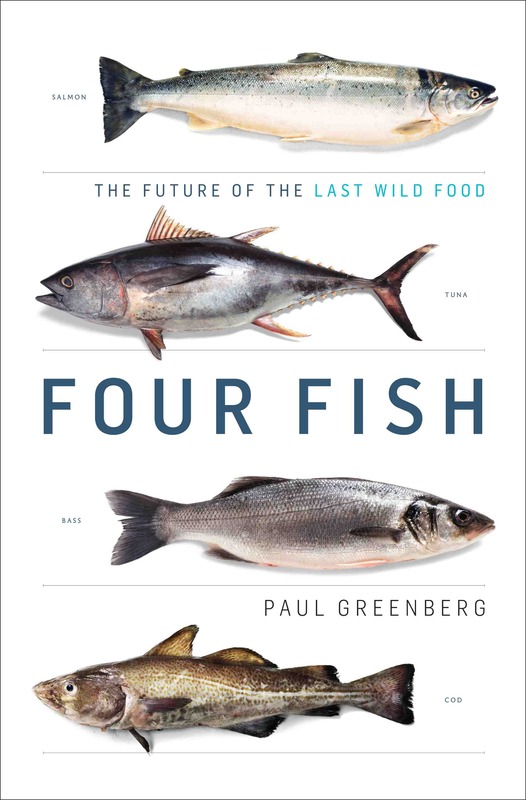 By examining the four fish that humans have deemed appropriate for “dewilding” — salmon, tuna, bass and cod — Greenberg uses Four Fish as an opportunity to develop a historical understanding of how and why these species have been selected for industrial human consumption, and what this means for the future of fish. And skewing nature we are. By selecting four species of fish for human cultivation, we have inadvertently downgraded the worth of other, less desirable fish, “abandoning the rest to gradual extinction” as Wayne Grady noted in his review. He spends the rest of Four Fish successfully convincing you of the latter, and the range and depth of his experience go some way towards making the current system of fish-farming seem repugnant. Greenberg weaves together the significance of his scientific opinions with the adventure of discovery as he introduces you to Mediterranean entrepreneurs, Middle Eastern marine researchers, Japanese offshore fisheries experts, and Alaskan Yupik Eskimos. While Greenberg is not in favour of a radical overhaul of commercial fisheries, he advocates for a greater awareness of what exactly humanity is doing when it manipulates natural food supplies. “Wild fish did not come into this world just to be our food,” he notes. And if alternative species are to be domesticated in future, Greenberg rightly notes the decision must be based on more than “market principles and profit” with little regard for how the chosen species naturally behaves. Fisheries managers and biologists must be brought into the conversation about food supply. Knowledge is power, and Four Fish is a tremendous place to start learning the history and politics of the fish on your plate. « Feature: Can the Young Liberals save the Liberal Party of Canada?